There have been more internet resources on solarpunk just recently, but not a lot of independent news has picked up on the concept–the concept itself wriggling through the soil and sprouting up. There is no one person promoting solarpunk; it’s a grassroots movement of visionaries, seemingly made up of people from all walks of life: writers, artists, environmentalists, engineers, scientists, and others. The concept of solarpunk may have a life of its own, born out of necessity, and as such, people have been writing and thinking about it without knowing about the term solarpunk. Adam calls himself one of the stewards of the movement, and I was very happy to catch up with him and get an interview. In the meantime, our site has a new solarpunk book category, and our Google+ community has also recognized solarpunk–but we have had more questions than answers. Mary: Adam, thanks so much for lending us some of your time to talk about solarpunk, which a lot of people want to know more about. I have some very fledgling questions, like: What is solarpunk? I thought at first it was a genre, but it seems to be an aesthetic appearing in both reality and fiction. Adam: Solarpunk is a somewhat promiscuous adjective, used to describe a vision of the future that we actually want. That means a future where high technology is put in service of humans and the environment. Which is to say, a solarpunk future is one that is “sustainable” at a not-just-for-rich-people level, a human-friendly future that can scale. As billions of people in the developing world begin the rise out of poverty, they are looking for a vision of the ‘good life’, and unfortunately the current vision tends to involve fast food, large cars, big houses, and conspicuous consumption. Sustainability at scale means renewable energy, reusable infrastructure, an end to throwaway culture, room for human dignity, and the possibility for continued flourishing (although perhaps in different ways than how we define it currently). It’s also a useful tag to throw onto intriguing areas of the “present weird.” When we look at the fights in Spain over rooftop solar, where they’re trying to make it illegal to disconnect your home from the grid, that’s a very solarpunk development. 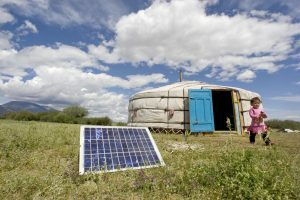 A majority of Mongolia’s 800,000 nomads are on solar; that’s something happening in the here and now. There are a lot of pre-existing currents of thought running into it: localism, transition towns, resilient communities, solidarity economies, social ecology, and so forth. There are great many thinkers and movements pushing back against a system that encourages efficiency at the cost of fragility, wealth extraction at the cost of ecological collapse, and self-replicating sameness over the local and particular. (I once referred to solarpunk as “the futurist equivalent of Slow Food.”) Sometimes the term is used to describe things we see in the world, and want to see more of; here I’m thinking of the widely spread Tumblr post about the greenery of Saudi architect Sami Angawi’s home, which is rooted in traditional Islamic architecture rather than what some excited kids on Tumblr are passing around. Mary: How did you get involved with this movement (do we call it a movement?). Adam: I’ve been following solarpunk as an embryo of an idea since about Spring 2012. (I’m also the main poster on Solarpunks.tumblr.com.) It’s been coined independently half a dozen times, mostly because it’s an easy analogy to make from steampunk (steam-powered is to solar-powered, etc. ), but no one was really doing anything with it. I gathered some interested parties in summer 2012, and we explored the subject of, “Solarpunk should be a thing. How do we make it a thing?” We had a lot of theories and notes, but not yet a strong visual aesthetic, not yet something that would make it pop into broader awareness.. So I tended the Tumblr, read more about distributed energy and localist infrastructure, and kept an eye on the hashtag. I also made contact with the folks from Arizona State who run the Center for Science and the Imagination, around May of last year. I don’t think anyone “owns” solarpunk, but I certainly feel like one of its stewards. As to whether it’s a ‘movement,’ I think it definitely has the potential to be one, but I think we’re another year out from it really being there. Mary: I understand that you are involved with ASU’s Hieroglyph project, which seems to call for a positive or utopian outlook for our future, rather than the doom-and-gloom one we often see. Can you describe this project, and where solarpunk fits in? Adam: If I recall correctly, it all started with a piece written in the World Policy Journal by Neal Stephenson (better known as the author of Snow Crash, etc.) about our growing inability to “do big things” anymore. In the mid-twentieth century, the argument goes, science fiction not only made science and engineering seem heroic, but they also provided “a plausible, fully thought-out picture of an alternate reality in which some sort of compelling innovation has taken place.” Experts across vastly different disciplines could talk to each other, because they had both grown up with Asimov. It’s an intriguing idea, and I really like what they’re doing in terms of connecting scientists, writers, and policy people to figure out what futures we might want to aim for. Now, sometimes “positive futures” are framed in terms of technological megaprojects, which has a whiff of the Promethean about it. One frequently suggested date for the onset of the Anthropocene is 1945, which corresponds exactly to that postwar flush of high-modern confidence that led us (mostly Americans) to intervene massively in ecological and human systems we didn’t fully understand. Some of that “doing big things” came out of an overconfidence in our abilities, and an inability to appreciate the dynamics of exceedingly interconnected systems. We went the to moon! That can’t pull our eyes away from the fact that we’re living in the Sixth Great Extinction, and we are the asteroid. That all said, I’m a big fan of Hieroglyph. Mostly because crafting positive or utopian futures is really hard and valuable work at this particular moment. There’s a tremendous amount of energy expended in our society today to block the exploration of meaningful alternatives to “the way things are.” Things are not getting better, the status quo is not fixing the problem, and we don’t have time for the luxury of self-pity. Mary: What past, present, or coming books and movies would you describe as solarpunk? Adam: The Brazilian sci-fi magazine Draco published a sci-fi anthology with that name, but we’ve yet to see an English translation. That’s probably the most direct source. In terms of past books, Kim Stanley Robinson (the Mars trilogy, Pacific Edge), Ursula K LeGuin (particularly The Dispossessed), and Octavia Butler’s Parable of the Sower could be seen as an example of a near-term ‘things will get worse before they get better’ setting that could lead into solarpunk. Digging further back, there’s an entire genre of visionary novels of the 19th century that were half science-fiction, half political manifesto. 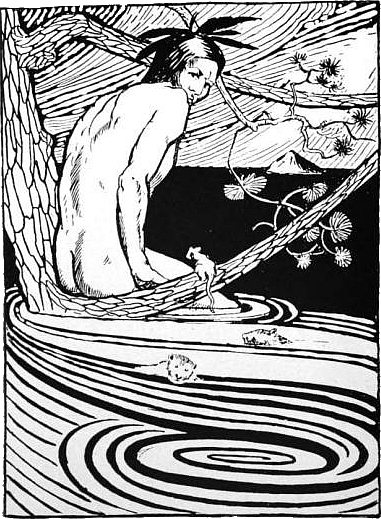 The most well known is Bellamy’s Looking Backwards, but there’s also News from No-Where by William Morris, a British artist and socialist of the late 1800s, better known as the initiator of the Arts and Crafts movement, which was a major influence on art nouveau, so he’s probably someone for budding solarpunks to read up on. How meanly and grossly do we deal with nature! Could we not have a less gross labor? What else do these fine inventions suggest, — magnetism, the daguerreotype, electricity? Can we not do more than cut and trim the forest — can we not assist in its interior economy, in the circulation of the sap? Now we work superficially and violently. We do not suspect how much might be done to improve our relation to animated nature even; what kindness and refined courtesy there might be. There are certain pursuits which, if not wholly poetic and true, do at least suggest a nobler and finer relation to nature than we know. The keeping of bees, for instance, is a very slight interference. It is like directing the sunbeams. Mary: I’ve heard the phrase innovative dissent used with solarpunk. Can you expand on this idea? Adam: I’m definitely not the expert on it, but it seems to me as though, if you’re thinking about technological and social progress, it should probably also extend to the ways we gather together to petition for a redress of grievances. Some of that is rooted in the idea of infastructure as a point of resistance: If you’re better able to withstand being shut off from the system as-it-is, you’re more able to protest against it. Self-reliance and communal resilience helps safeguard you against reprisal. But a lot of it is coming out of just being alive and watching Twitter. Greenpeace activists are doing crazy daredevil boat-climbing to scale and chain themselves oil rigs before they’re delivered to the drill site. First Nations groups are doing amazing things to block pipelines through their land. There are drawings of Bree Newsome as Wonder Woman, taking down the confederate flag. Every day, some group is doing something brilliant, innovative, and fearless to punch through the bubble of manufactured normalcy that we tend to live in. It’s there if you follow the right people. Mary: If one wants to find more about solarpunk, where would they look? Can you foresee it having a big following like steampunk? How is this aesthetic being promoted? Adam: I’m hoping to put together a zine or ebook this summer, fingers crossed on that. At present the best way is to get on Tumblr and start searching, reblogging, and running down the couple dozen solarpunk Tumblrs up there. But it’s grown to the extent where there needs to be a bit more in the way of signposts, orientation guides for someone who’s just heard about it. I should probably just put my money where my mouth is and write some solarpunk fiction. Mary: Finally, is there anything else you would like to add? Adam: Also worth talking to is Matt Cloyd from Code for Boston, who quoted me extensively in his Ignite talk: https://www.youtube.com/watch?v=tqhrw0myEH0, and Justin Pickard, a grad student and fellow explorer of the intersections between sustainability and possible futures ahead of us. He’s done some interesting investigation into the fights over rooftop solar and public utilities, and given talks on the concept to confused punks in Brighton. We worked together on a great big essay (unfinished), some of which was adapted into the Hieroglyph piece. Mary: Thanks, Adam, for shedding some light on solarpunk. I committed to promoting solarpunk at Eco-fiction earlier this year and will continue to do so. Please keep in touch about your zine and other projects! Updated note on July 3: See the Goodreads #Solarpunk List.